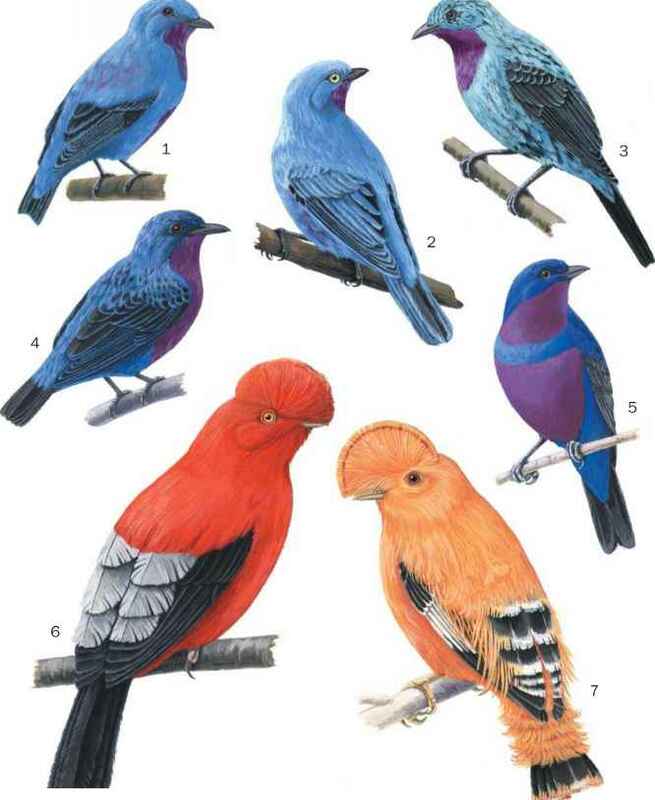 French: Cotinga de Cayenne; German: Halsbandkotinga; Spanish: Cotinga Grande. The average weight is 2.7 oz (76 g). Sexually dimorphic. Females are darkish brown with a light brown, spotted breast. Males are a stunning turquoise color with shimmering iridescent feathers and a band of blue across the chest. This species is found throughout the Amazon. It is the only species within the genus that overlaps the geographic distribution of other congeners. This species is a canopy specialist in lowland tropical evergreen forest. 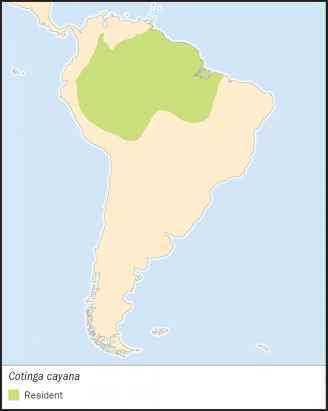 While principally a lowland species, it may range up to 0.5 mi (800 m). gas will flatten themselves horizontally, moving the wings and spreading the tail while emitting a soft and mournful "hooooo." Various congeners will forage in the same tree with spangled cotingas, such as plum-throated cotinga (Cotinga may-nana). The spangled cotinga will also forage with other species of cotingas including the purple-throated (Querula purpurata) and bare-necked fruitcrows (Gymnodoerus foetidus). While conspecifics are often found in close association, there is at least one record of a male spangled cotinga chasing another male from the area. A female spangled cotinga and female cinereous mourner simultaneously mobbed a female barenecked fruitcrow through habitat that was atypical for the latter species. On another occasion a male spangled cotinga was observed chasing a black-headed parrot (Pionites melanocephala). The mating system is not completely known within this group. However, there is some evidence that loose lek associations may be in place.